Miniature pumpkins are cute on their own, but we made them better than ever by adding candles. 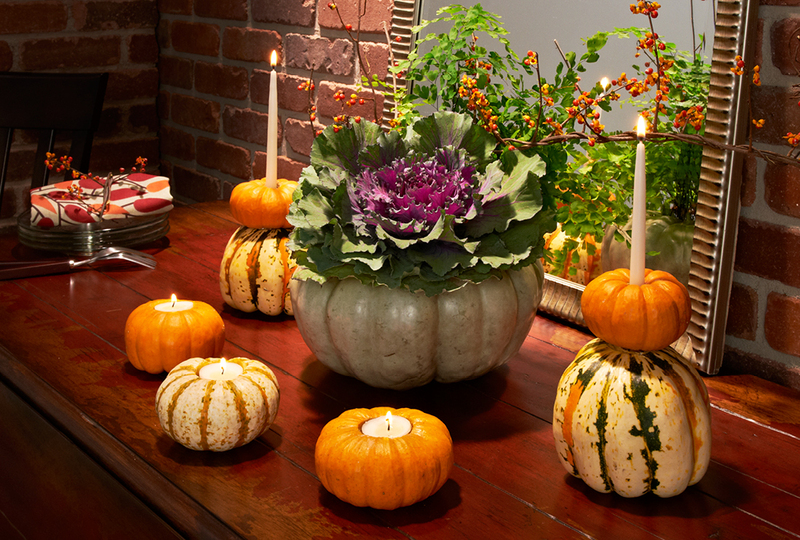 The festive votives provide an easy, inexpensive way to illuminate a fall centerpiece. In addition to the miniature pumpkins (photo 1) and votive candles, we used a cordless drill, a 11/2" spade bit, a teaspoon, and a small amount of sand. To create each pumpkin votive, start by using a drill and a spade bit to make a hole in the top of a mini pumpkin (photo 2). You can purchase spade bits of various sizes at your local home center — find one that's just slightly larger than your candles. The pumpkin may still have some pulp left inside the drilled hole. Use a teaspoon to easily scoop out the remaining pulp (photo 3). Next, pour a little sand into the bottom of the hole (photo 4). If you don't have a funnel handy, just use a piece of paper like we did. Now drop in a votive candle (photo 5). Adjust the level of the sand as needed so the candle's top is flush with the top of the hole. In addition to the candle votives, miniature pumpkins and a few other gourds provided great starting points for creating a fun fall centerpiece. We decided to add some height to our fall decor by making candlesticks from gourds. First, we drilled holes all the way through a couple of miniature pumpkins with a 1/2" spade bit. Then we used a hot glue gun to attach the miniature pumpkins to the tops of larger upside-down gourds (photo a). A larger gray gourd became a container for a beautiful fall plant arrangement. To make the "vase," we just carved a hole in the gourd's top with a drywall saw, and then cleaned out the pulp. We arranged a selection of live plants and decorative branches from the craft store inside (photo b).